Technical Pro is known to make professional gear that is built-to-last, from microphones to mixers to amplifiers and speakers! The same innovative technical approach they use for their electronic equipment can be found in their racks and stands. Knowing that stands and racks will hold valuable equipment they use the highest level of craftsmanship insuring that whatever gear it holds, it will be safe and secure! 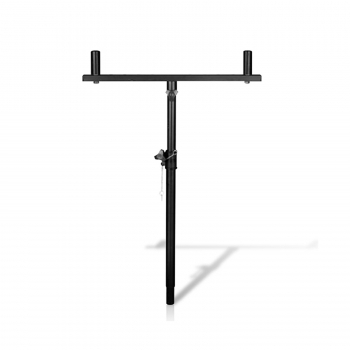 The PT12 Professional Steel Subwoofer ''T'' Pole Mount from Technical Pro is a high quality speaker stand that can handle small to large loudspeakers and monitors. 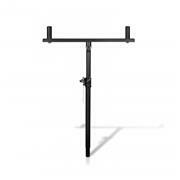 This durable pole mount is constructed from anodized steel alloy tubing. Anodizing increases corrosion resistance and wear resistance, and provides better adhesion for paint primers and glues than does bare metal. This method of construction will insure that your speaker stand keeps it smooth finish and has no corroding on key movable parts including clasps and screws. The PT12 has a height range from 2' 8'' - 4' 7''. This is the perfect height for setting up speakers in a club setting, showroom, live stage show or outdoor venue. Raise or lower your stand to your desired height with ease. The total load capacity is 100lbs, plenty of support to handle most any large scale loudspeaker or monitor. The PT12 is lightweight coming in at 7 lbs total. If you are setting up and breaking down speakers going with Technical Pro’s line of speaker stands is a must do! At a price that is almost too low to list, this is the first choice for today’s sound professional!